Astronomers using critical observations from the Gemini Observatory have found the strongest evidence yet that the formation of more massive stars follow a path similar to their lower-mass brethren – but on steroids! outburst mid-infrared images (right) taken with FORCAST / SOFIA at 7.7, 19.7 and 31.5 microns (2016). Copyright: Caratti o Garatti. 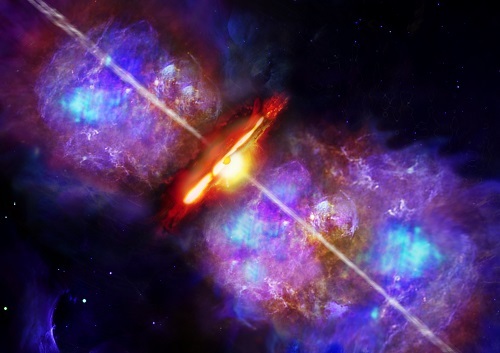 The new findings, that include data from Gemini, SOFIA, Calar Alto, and the European Southern Observatory, show that the episodic explosive outbursts within what are called accretion disks, known to occur during the formation of average mass stars like our Sun, also happen in the formation of very massive stars. The international team of astronomers (led by Caratti o Garatti) published their work in the November 14th issue of the journal Nature Physics, presenting the first clear case that massive stars can form from clumpy disks of material – in much the same way as less massive stars. Previously it was thought that the accretion disks seen around lower mass stars would not survive around stars of higher mass due to their strong radiation pressure. Therefore, some other process would be necessary to account for the existence of more massive stars – which can exceed 50-100 times the mass of our Sun. According to team member Dr. Bringfried Stecklum of the Thüringer Landessternwarte Tautenburg (Germany), “Studying the formation of high-mass stars is challenging because they are relatively rare and deeply embedded in their natal cloud, thus not visible in optical, or visible, light. This is why we need infrared instruments like the Near-infrared Integral Field Spectrograph (NIFS) at Gemini North on Maunakea in Hawai‘i.” The outburst events are also very rapid, probably lasting only a few years or less – which, for a star, is the blink of an eye, adding to their rarity. The developing star observed in this study, S255IR NIRS 3, is relatively distant, some 6,000 light years away, with a mass estimated at about 20 times the mass of our Sun. The Gemini observations reveal that the source of the explosive outburst is a huge clump of gas, probably about twice the mass of Jupiter, accelerated to supersonic speeds and ingested by the forming star. The team estimates that the outburst began about 16 months ago and according to Caratti o Garatti it appears that the outburst is still active, but much weaker. Disk-mediated accretion burst in a high-mass young stellar object, A. Caratti o Garatti, B. Stecklum, R. Garcia Lopez, J. Eislöffel, T. P. Ray, A. Sanna, R. Cesaroni, C. M.Walmsley, R. D. Oudmaijer,W. J. deWit, L. Moscadelli, J. Greiner, A. Krabbe, C. Fischer, R. Klein and J. M. Ibañez , Nature Physics Journal Nov. 14 th 2016, DOI: 10.1038/NHPYS3942. Gemini’s mission is to advance our knowledge of the Universe by providing the international Gemini Community with forefront access to the entire sky. The Gemini Observatory provides the astronomical communities in six partner countries with state-of-the-art astronomical facilities that allocate observing time in proportion to each country’s contribution. In addition to financial support, each country also contributes significant scientific and technical resources. The national research agencies that form the Gemini partnership include: the US National Science Foundation (NSF), the Canadian National Research Council (NRC), the Chilean Comisión Nacional de Investigación Cientifica y Tecnológica (CONICYT), the Australian Research Council (ARC), the Argentinean Ministerio de Ciencia, Tecnología e Innovación Productiva, and the Brazilian Ministério da Ciência, Tecnologia e Inovação. The observatory is managed by the Association of Universities for Research in Astronomy, Inc. (AURA) under a cooperative agreement with the NSF. The NSF also serves as the executive agency for the international partnership.